Know those “Dirty mouth? Clean it up!” commercials? Well, they ain’t got nuthin’ on Corning. 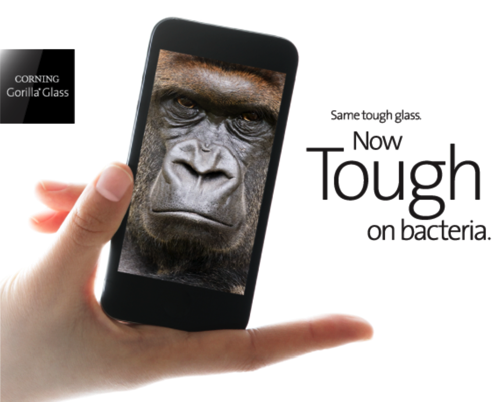 Yup, Corning Gorilla Glass is now strong AND clean thanks to new antimicrobial properties. It is, in fact, the first EPA-registered antimicrobial cover glass. Don’t think it’s a big deal? Just look at your phone’s screen under a high-power microscope and you’ll change your tune. Thousands of bacteria live on a mobile device surface. Every tap, swipe and phone call results in further exposure of the touch surface. With the rapid growth of touch-enabled devices, this is becoming a growing concern. Antimicrobial Corning Gorilla Glass – the first EPA-registered antimicrobial cover glass – can help. Want to learn more? Read about it here.